There needs to be an inner ledge beneath the top for the cone to rest on. I used card stock to fabricate a test ledge for the inside of the guitar. I found that I had to create it in 2 pieces in order to get it into the body. 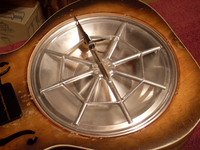 This piece rests close to the tail block and at the other end rests close to a ladder brace between cone opening and neck block. The sides of the ledge are pretty close to the kerfing at the rims. I used a good grade of 5/16" 5 ply plywood. 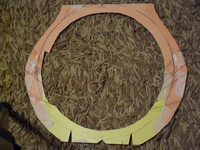 I made the joining edges quite oblique to increase gluing surface on the ledge edges. If I had needed more depth I would have shimmed the ledge away from the underside of the top rather than shimming the cover plate up from the outside of the top. 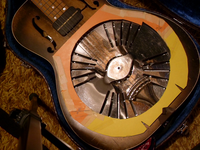 The hole in the top was opened a bit to allow a dobro cone to enter the body. 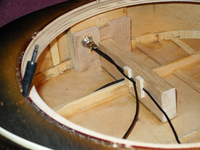 The plywood ledge was glued in over-sized in the centre and then opened up with a hand held sanding drum to provide enough of a ledge for the dobro cone to rest on. For both of these openings, now is the time to compensate for past egging. I added an additional thin piece of wood to tail block as I wanted to insert a long electric jack through there, and felt the extra tail block added additional support for that. I also added a long piece of wood from the tail block into the inner body to help prevent further egging of the body. 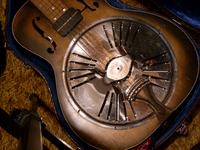 I had to extend the cover plate holes outward just a bit due to the increased diameter of the resonator opening.